Have you ever had patches of whitish or pinkish acne-like bumps on your upper arms, thighs, or less commonly, the buttocks, or face? 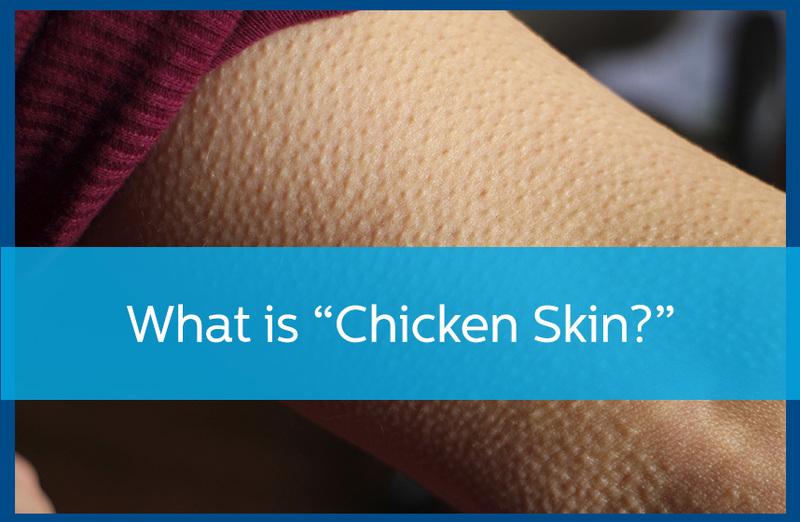 Then you might have keratosis pilaris, often shortened to “KP.” The condition derives its name from the bumpy, rough patches that can look very similar to the skin of a freshly plucked chicken. It can be seen at any time, but is particularly common in adolescence, affecting over half of adolescents at some point. It tends to improve with time, although a smaller percentage of adults also continue with KP. Although keratosis pilaris isn’t serious, it can make you feel self-conscious, and it does require professional care to keep it under control. Keratosis pilaris develops when in the surface of your skin forms small “mounds” surrounding each hair follicles. Usually, the condition affects many plugs, resulting in the rough patches that are characteristic of the condition. The condition is the result of a harmless genetic abnormality which makes the surface skin proteins “heap up” around the hair follicles. The condition is more common among people with some other skin conditions, like eczema, or atopic dermatitis, and it also occurs more commonly in people with dry skin or during winter months when air is drier. Keratosis pilaris most commonly occurs on the face, arms, thighs and buttocks, but it can occur in other areas as well, and sometimes the patches can become itchy. When it occurs on the face, it can cause inflammation and scarring if not treated properly. While there isn’t a single cure for keratosis pilaris, it can be managed and kept under control. Treatments focus on softening the deposits of keratin so they can be gently removed with exfoliation. Topical exfoliants help loosen keratin deposits while also softening skin and moisturizing it. Vitamin A derivatives may also help by promoting skin renewal and preventing plugs from forming in the follicles, but they can be irritating to some people. Laser therapy may also help, especially if the condition causes inflammation or significant redness. Because there’s no cure, it’s important to see your dermatologist regularly for ongoing care to prevent flare-ups and inflammation. If you think you may have keratosis pilaris, or if you notice any unusual symptoms affecting your skin, we can help. Call Avail Dermatology today at 770-251-511, and schedule an evaluation. https://availdermatology.com/wp-content/uploads/2016/07/ChickenSkin.jpg 560 858 John Lenz /wp-content/uploads/2017/08/logo.png John Lenz2016-07-08 15:39:012018-08-06 19:48:35What Is "Chicken Skin?"